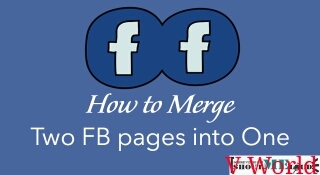 This Post is About Merging two or More Pages with Similar Name in facebook. > The two pages must be of same category. > The two Pages name must matches. Step 1. Go to Page Settings - General Settings. Step 2. Scroll to the Last of General Settings, You'll Find an Option saying merge pages. Step 3. 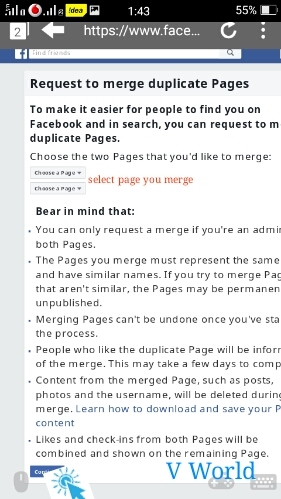 Click on that Setting and Click on the Link Saying "Merge Pages". Step 4. 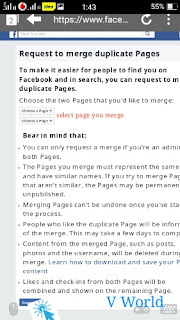 In the Next Page, Choose the Page you want to keep after merging and the pages you want to merge. When you no have pc using "Puffin web browser"
0 Response to "Merge Two Facebook Pages Into One "